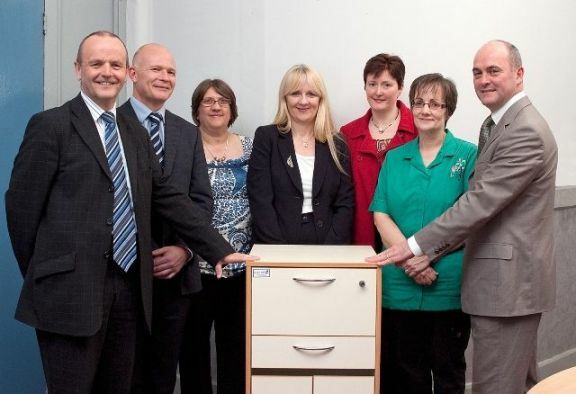 The Northern Health and Social Care Trust (NHSCT), has received £50,000 from Hospital Metalcraft Ltd in recognition of the trust’s contribution to the development of a key-less locker system. The locker system facilitates storage and administration of medicines at the patient’s bed-side, and includes patient self-administration ability. Mr Ian Farnfield said, “The help of the trust’s employees in enabling us to evaluate our designs and to react to practical medical input was very useful to us in this project. We have many decades of experience in designing and manufacturing hospital equipment but the practical advice given by your staff enabled us to achieve a very useful result in this project”. The locker was developed as part of the national award winning Medicines Management Programme in Antrim Hospital. Hospital Metalcraft designers worked with both pharmacy and nursing staff within the trust to develop a locker that would meet the needs of patients, nursing staff and the statutory storage requirements for medicines. improved ability to effectively disinfect. The Pharmacy and Medicines Management team who provided input into the design of the key-less locker system: (left to right) Prof Mike Scott, Head of Pharmacy & Medicines Management, NHSCT; Ian Farnfield, Sales Director, Hospital Metalcraft Ltd; Bernie Irvine, Sister, NHSCT; Dianne Gill, Deputy Head of Pharmacy & Medicines Management, NHSCT; Sarah McGinnity, formerly Principal Clinical Pharmacist, Antrim Hospital, NHSCT; Agnes Hunter, Pharmacy Technician, NHSCT; Sean Donaghy, Chief Executive, NHSCT. Dr Des Rooney, Director of Research and Development for NHSCT, said that this particular collaboration was representative of the trust’s commitment to the encouragement and development of innovative ideas to improve healthcare working with industrial partners. Professor Mike Scott, Head of Pharmacy and Medicines Management, said that this was one of several joint health service private sector initiatives that the department was involved with, linked to differing aspects of medicines management and process re-engineering. 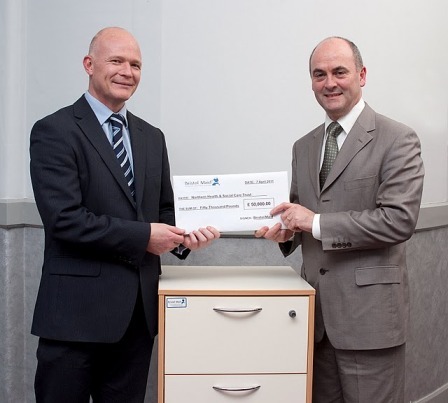 Dr David Brownlee, from HSC Innovations, worked closely with Hospital Metalcraft Ltd in securing the agreement of this payment to the trust in recognition of their contribution to the key-less locker technology. He said that this was an excellent example of how HSC can work with the private sector, especially in the demonstration of clinical utility in the development and design of new healthcare products. He also encourages HSC staff with innovative ideas to improve patient care to contact HSC Innovations for further assistance and support in developing these ideas into products that will ultimately benefit patients. Professor Bernie Hannigan, Director of HSC R&D for Northern Ireland, congratulated the trust and said that it is excellent to see how knowledge and experience gained within the health sector can contribute to local industrial development.